This review was sponsored by our friends at mentos! Flavor: Oh man, wow. The initial burst of flavor in this one is a nasal-clearing rush of minty awesomeness. I just ate the garlickiest lunch imaginable, popped 2 pieces of this and the funk has been completely obliterated. I’d feel comfortable having a closed-door meeting seated next to the company president right now. After the blast of freshness, it settles down into a nice, sweet classic wintergreen that lasts as long as I’ve chewed (at least 20 minutes). Texture: The outer shell of this gum is thicker than most pellet gums, so the initial crunch is delightful and lasts an extraordinarily long time. It’s fantastic. Once the shelly bits have disintegrated, the chew that’s left is just fine. Nothing great or anything, it’s not smooth or shiny in the mouth like I prefer, but it’s certainly not too soft or too hard, it’s not gonna fall apart in your mouth, get stuck in your teeth, or cause jaw fatigue. Presentation: I like what Mentos does with their packaging. The plastic tube, while certainly not the most healthy thing for the environment, contains the gum so that it doesn’t spill out into your purse, and it avoids the standard pop-out foil packs that pellets are usually packaged in. Not that there’s anything really wrong with the pellet packs, but they kinda seem to be a way to cheat us out of gum. 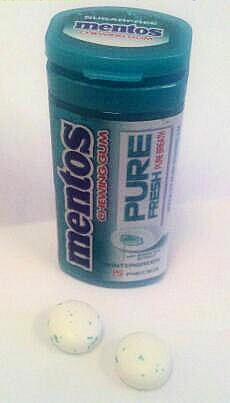 A standard pellet pack contains 9 or 12 pieces, but this tube of Mentos contains 15 pieces – as many pieces as standard pack of stick gum. Maybe it’s a small thing, but for those of us that spend a calculatable percentage of our income on gum, small things add up. I guess if you’re super eco-green-sustainable-recycler, you could re-use the tubes for other things. Also, the label on this particular flavor has a reflective, shiny holographic quality to it that really makes it stand out. Overall: I was pleasantly surprized when our friend over at Perfetti Van Melle contacted us and offered to send us some complimentary Mentos gums, because neither of our other mentos reviews really favored the brand. I was again pleasantly surprized to find out how delightful this gum really is. Maybe they’ve reformulated since I’ve last chewed it, I don’t know, but this really is a fantastic gum.